This final stage isn't particularly lengthy, but it's packed full of life-draining battles and there aren't a lot of chances to recuperate along the way. 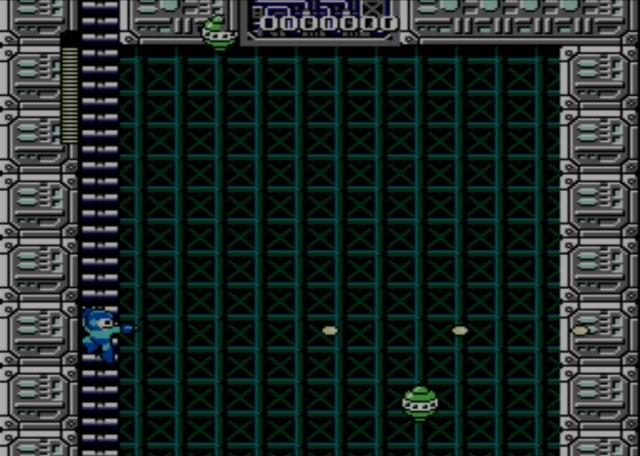 You appear on a solid platform, positioned between twin spike beds to the left and right. You're best off waiting for a bit, as green pods will rise and descend from the bottom and top areas of the screen, respectively. Blast them until they're gone, then hop along the blocks and leap to the ladder along the room's left side. Climb it. In the next screen, you will encounter more of the pods. 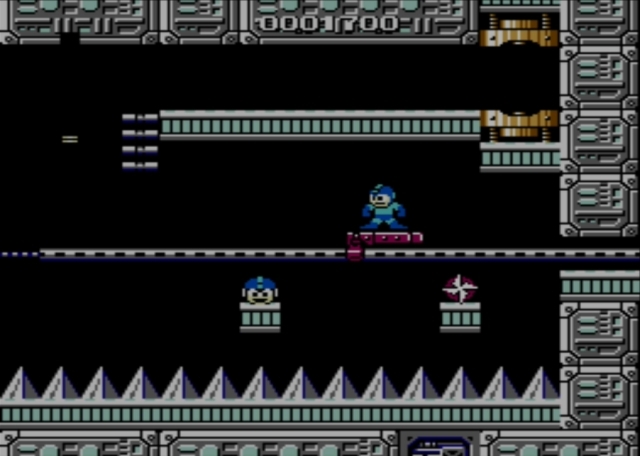 Climb a short distance up the screen along the ladder, then face right and blast the pods as they get within range. Then you can climb once more. From the top of the ladder, start right with the Guts ability equipped. Clear some blocks out of your way and possibly throw one of them at a sprinkler-like enemy on the ceiling ahead. The rest of those enemies you'll have to deal with some other way. Then you'll reach a couple of ladders, which you can climb to a ledge looking out over a bed of spikes. Hop onto the small platform, then wait. 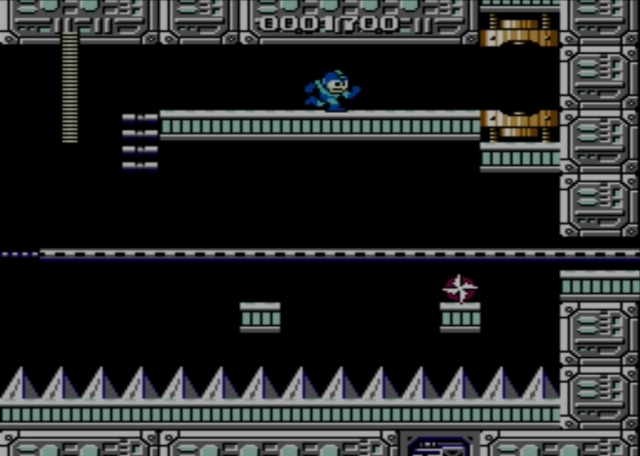 You are basically in a small version of the Guts Man stage, which means a platform will come along the track shortly. Hop onto it and ride it toward the right. When you approach the stripped wire, you need to leap out onto the block hanging in the air above it. Then you need to jump right again as the platform finally rights itself. 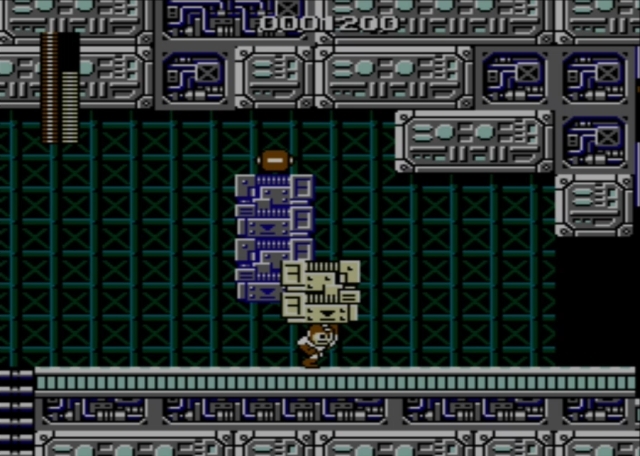 Ride the platform right, but rather than ascending the ladder, let it carry you over a block with a 1-up icon. To the right from there is a block with a familiar Japanese symbol that has appeared in numerous Capcom games over the years. It refills all of your special weapon energy. Collect it, and then wait for the platform to start back to the left. You can ride it in that direction and grab the 1-up icon. Then wait for the platform to make its circuit and you can next hop to it and to the ladder overhead. 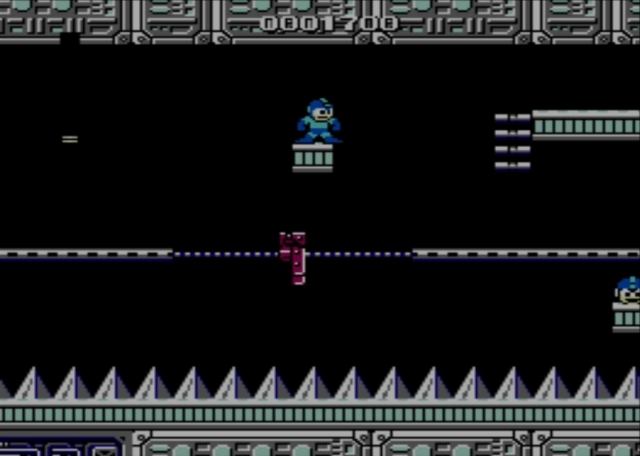 Climb that ladder up to the higher ledge and walk right to enter the waiting teleporter, which leads you to a boss battle with Bomb Man. It is critical that you complete this fight while taking the least possible amount of damage. 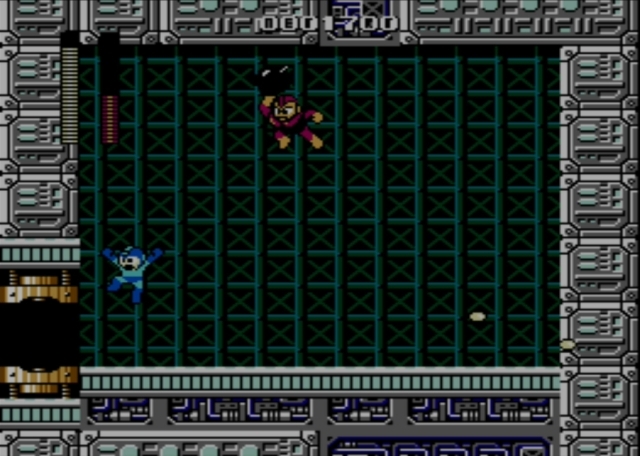 In general, Bomb Man is one of the easier robots to defeat even with just the arm cannon, but you can't afford to take more damage than absolutely necessary because you have to face three more robots in succession. 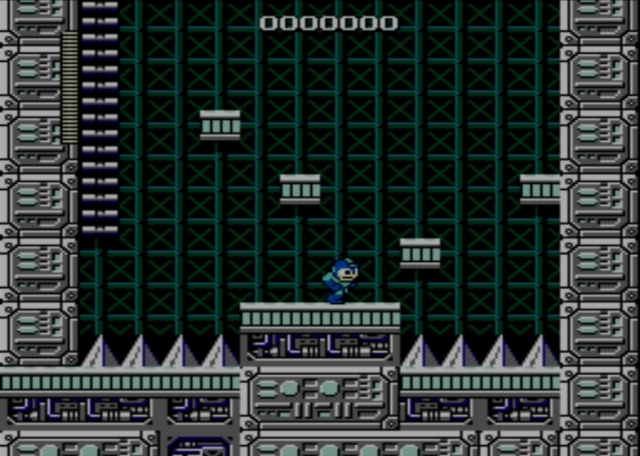 If you fall in battle, you have to start over again with Bomb Man. Use your fire weapon to take out Bomb Man quickly. Then use your ice weapon on Fire Man. 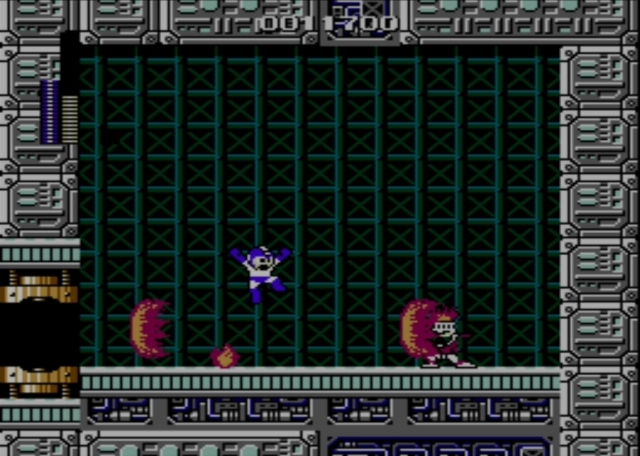 Ice Man will fall to a few quick shots from your electric beam, and that leaves Guts Man, who is weak against your bombs. Don't be afraid to cheat if you must. Survival is what's key, and you want to get through these last robot masters with at least one complete extra life to spare, so you can battle Wily starting with full health. Once you have defeated Guts Man (and brought your adventure pretty much full circle, when you think about it), then you're ready to face off against the mad doctor himself. You have at last reached the final battle, which plays out in two parts without a breather along the way. 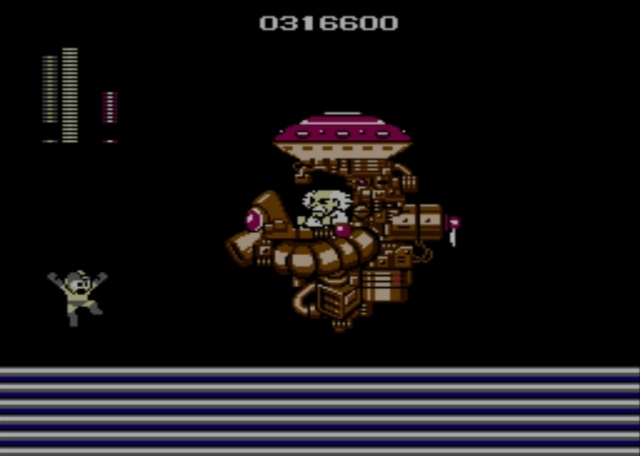 Dr. Wily rides in an armored ship that hovers just off the ground and moves slowly left toward you, then backs away, then approaches again. It will keep this pattern up as long as the fight lasts, which won't be long. You'll either quickly whittle away at its life meter, or you won't and you'll take more damage than you can survive. Stand near the left side, or run back and forth so shots arc over your head. They have an unfortunate tendency to home in on your exact location, so either tactic feels inadequate. You may instead prefer to jump and fire an electric shot, then use "the pause trick" again to quickly drain the ship's life meter. Once the meter empties, it refills and now you have a shot at the mad doctor himself, who is still aboard the ship. Finish the job with more electric charges, or with cutter blades, still in conjunction with "the pause trick" (since otherwise, your life meter is likely to empty). 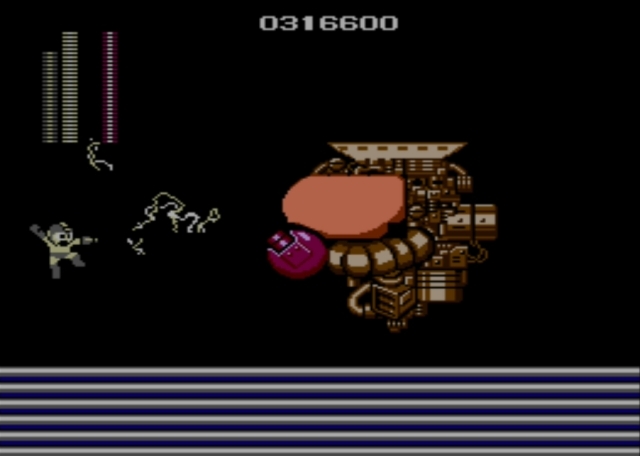 When you drain Wily's meter that second time, the battle ends and you've beaten the game.